Baden-Powel (Founder of Scouting) on uniforms! 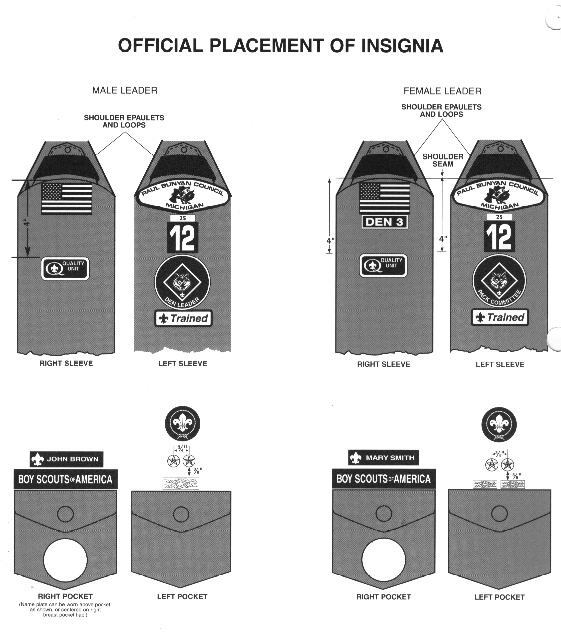 The Boy Scouts of America has always been a uniformed body. There are many reasons for this. But one reason stands out above all the rest. We wear the uniform because it is a means of identifying ourselves openly with the principles to which we are committed- character development, citizenship training, and physical and mental fitness. We stand together, not alone in encouraging others to live by these same principles. Boys and adults alike should take pride in belonging to such a movement and wear the uniform as it is intended. The distinctive Blue and Gold uniform of the Cub Scout is undoubtedly one of the major incentives for young boys to become Cub Scouts. 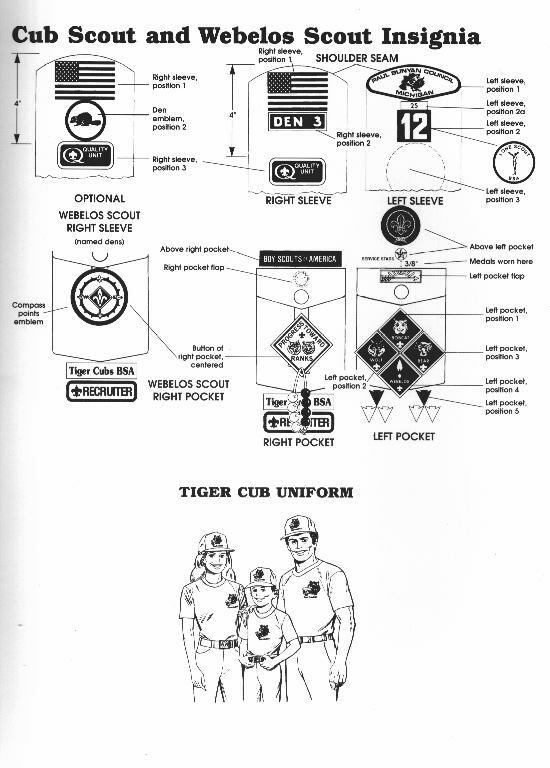 The Tiger cub uniform consists of the Tiger Cubs BSA T-shirt and hat. It is highly recommended that the adult partners also wear the Adult Tiger Cub BSA T-shirt or Sweat shirt. 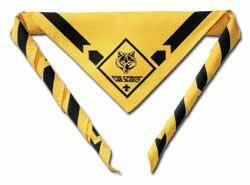 Neckerchief slide- Official Neckerchief slide is gold colored metal slide with the Cub Scout emblem. Hand made neckerchief slides may be worn. Cap- Official Cub Scout Hat, baseball style cap- navy blue with gold front panel and Cub scout emblem. There is a NEW Bear hat this year available for purchase. Current "Bears" Can still wear the old hat. Belt- Official Blue web style belt with brass buckle and Cub scout emblem. Trousers or Shorts- In our Pack this is an option. They are Blue Official trouser or shorts. Machine washable poly/cotton. For Camps the boys need to have complete uniforms, in most cases this includes pants or shorts. Socks- Official Cub Scout socks are Navy blue with Gold top. They are worn with shorts and trousers. 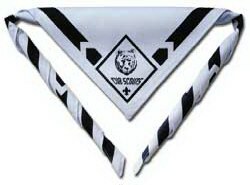 Neckerchief- Official Webelos neckerchief- triangular; blue, green, gold, and red plaid pattern with Webelos emblem. Neckerchief slide- Official Webelos neckerchief slide- gold colored Metal with Webelos emblem. Handmade slides may also be worn. Cap - Official Webelos baseball style cap- navy blue with light blue front panel and Webelos emblem. There is a NEW Webelos hat this year. The old one will still work. 2nd Year Webelos should just wait a year to buy the Boy Scout hat. Belt - Official Cub Scout Blue web style belt with Webelos belt buckle and Webelos emblem. 2nd Year Webelos may wear and our encouraged to start wearing the Tan Boy Scout Shirt and Green Boy Scout pants with their Webelos Uniforms. The 2nd Year Webelos now earn the Webelos badge that accompanies the Boy Scout Uniform and transitions the Scout in to the Boy Scouts. Where the patches go on the uniform!